flowers, in the foreground, grow where was formally [sic] the lane. This picture was taken 29th of June 1898." 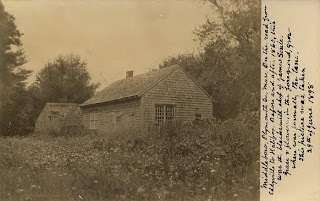 This real photo postcard depicts the James Soule blacksmith shop which stood on the west side of Cedar Street, Middleborough, between Soule and Winter Streets. The shop was operated by James Soule (1811-84) and was built on Soule’s homestead farm [now 94 Cedar Street] probably in the late 1830s or 1840s. It is clearly shown on Walling’s 1855 map of Middleborough, and it remained in operation through at least 1880 when Soule is listed as a blacksmith in the census record for that year. The shop was one of three which once served the Soule Neighborhood, including an earlier one at the corner of Cedar and Winter Streets and a later one at the corner of Cedar and Soule Streets.